Since 1970 Turner Industries II, Ltd. has been manufacturing apparel in Bowling Green, Kentucky. The label, Turner Originals™, was started as way for Turner Industries II, Ltd., to market their own products, under their own label, in Europe and to the big and tall market in the United States. Since 1991 the Turner Originals™ label has come to symbolize “Made in the USA” at its finest; high quality, easy care and long lasting fabric, generous specifications for a comfortable fit that seems to get better the more you wear it, and a company committed to standing behind its product! 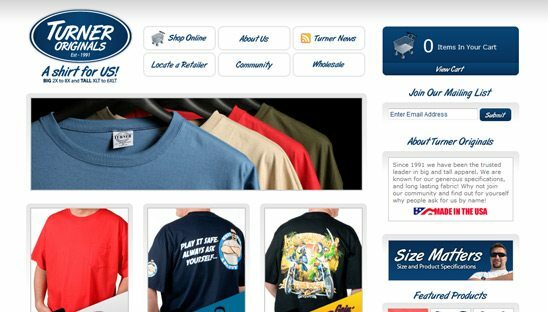 The Turner website was built using Shopify. In our opinion, Shopify Cart is the best on the market. Designing and coding inside is very similar to WordPress. We are very proud of the work that went into this site, the coding is pretty in depth.